The play was created back in 2014 and other than the two musicians who play on-stage instruments, the play only uses 6 actors and one stage set. 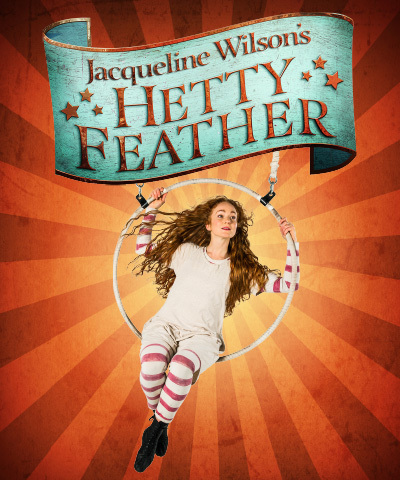 All of the actors (apart from Phoebe Thomas aka Hetty Feather) play various roles, switching from their main roles of playing Hetty's foster siblings/mother to playing circus characters, staff and children at the foundling hospital as well as many other roles. I think the way they've created the play is very clever and unique. Although you have to use your imagination in some parts, the ways they represented and created different elements of the play was very creative. For example, to represent the characters (such as Hetty and Gideon) as babies they used a blanket as a prop and had the actors follow around where the blanket was passed to - making baby noises such as babbling and crying, it was such a clever way of getting the audience to understand which actor was playing which baby and helped us understand their personalities before they were even old enough to talk and walk. The book was released back in 2009 and although I began to read the book, I never actually finished it so watching the play at the beginning of this month, made me only remember small parts and therefore only minor changes that had been made between the book and the play. For example, at the foster home Hetty doesn't find out where the other children are going until she, herself is returned to the Foundling Hospital; however, in the play, her and the other children are quickly made aware that just before they turn 6, they will be returning to the hospital. The play is aimed at families and young children but I think it's suitable for all ages as the way they've created and set out the play makes it an interesting and unique story that everyone can enjoy. To find out more about the show click here! "Great theatre is about challenging how we think and encouraging us to fantasize about a world we aspire to"